The BAT100 manual attenuator is used to attenuate bright sources in order to prevent the signal from saturating the spectrometer. This is achieved by manually adjusting a thumbscrew positioned directly in front of the face of the fiber. 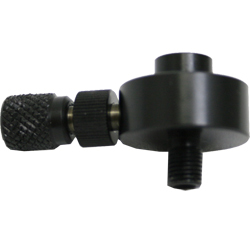 The BAT100 consists of standard SMA 905 connectors, allowing you to connect a fiber on one end, and either a spectrometer or a light source the other end.